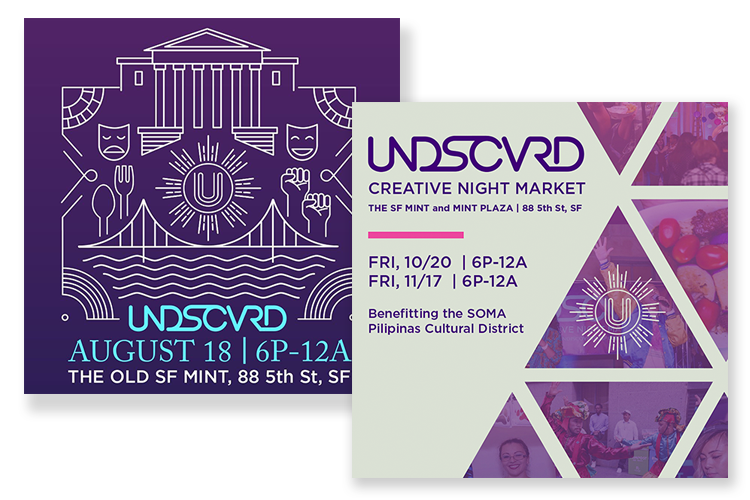 Inspired by the night markets of Asia, Kultivate Labs created a vibrant multifaceted night market experience to help kickstart economic growth within the newly minted cultural district in San Francisco, SOMA Pilipinas. Using crowdfunding, Kultivate Labs raised over $40k to help launch this monthly market featuring emerging Filipino food brands, handcrafted specialty goods, apparel, live art & music. Working with PLINTH I served as creative director, creating the look and feel of all of the event including the logo, digital marketing assets, crowdfunding rewards and advertising, environmental signage, & staff tees.